Meet our new officemate BB! He has really been a blessing to our church ever since his owner Bobby brought him. Our church Victory Greenhills is now his new home. And now BB in relationships! 1. Approachable – you can come to him all the time. Won’t get mad at you. 2. Available– He’s always there for you, won’t leave you no matter what. 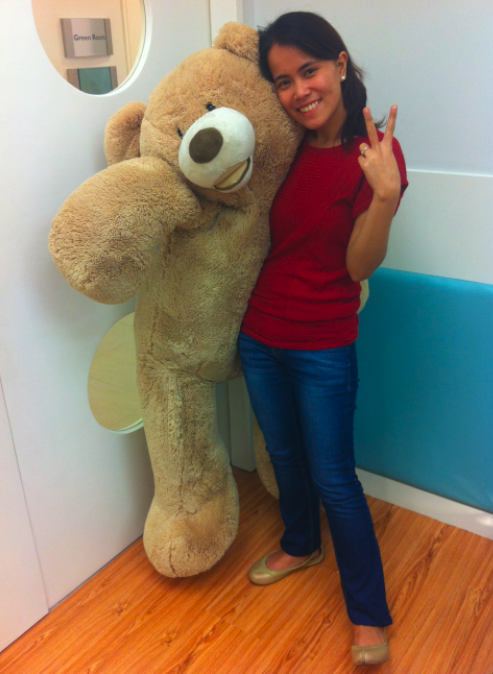 BB’s “bear hug” is always for free unconditional love for everyone who would come to him. 3. Fun-loving– BB taught me that life is not just all about work, rules, exchange of empty words. Setting time for recreation and having fun together is a must in any valued relationships. 4. Friend– He will be there if you need a company, someone to play with. 5. Good listener– He’ll listen to you and won’t lose his focus, and he’ll make sure you’ll get to finish all that you have to say. These qualities would help us a lot in dealing with the people dear to us. See Gospel according to BB!